There’s a new restaurant in town and they’re serving up sandwiches. Setting up shop in C’est Si Bon’s previous location, Newfangled Kitchen quietly opened its doors in Bexley in December. This new lunch and dinner destination accepts Cap Bucks, joining Moshi Sushi and Jimmy John’s as one more off-campus dining option for students. Newfangled Kitchen moves into Bexley after C’est Si Bon’s departure in September 2018. 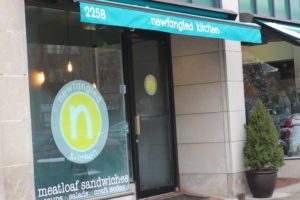 “Our main thing is meatloaf sandwiches, which sounds weird but they’re really good,” Alison Schmidt, junior marketing major and employee of Newfangled Kitchen, said. Schmidt described Newfangled Kitchen’s cuisine as a kind of comfort food with a more modern style. The menu includes meatloaf and vegetarian sandwiches along with various salads, soups, and sides. “[We] make everything from scratch … the meatloaf is made in like a big tote … and we slice our own deli meat,” Schmidt said. The restaurant is open every day of the week except for Monday. “From a business standpoint, you do most of your business between Friday and Sunday nights, so [it makes sense] being closed on Mondays. Most people don’t go out on Mondays because it’s the start of the work week,” Schmidt said. 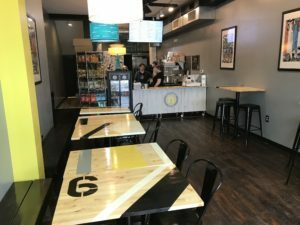 While the same space issues that C’est Si Bon had with seating still remain, Newfangled Kitchen has partnered with other Main Street businesses to offer alternative carry-out options. “You can actually take our food to the Drexel or House Wines and eat it there,” Schmidt said. Newfangled Kitchen also caters to those with dietary restrictions, offering gluten-free bread, dairy alternatives, and vegetarian options. I visited Newfangled Kitchen myself to get a taste of what the restaurant offered, once alone and once with a few friends. The first time I walked in, the restaurant was empty of customers. I looked around and admired the new décor that had replaced C’est Si Bon’s French café style. The walls are now decorated with stylized posters featuring the names of some of the new restaurant’s sandwiches, and the tabletops have been replaced or refurbished with new wooden surfaces that looked like they had been pulled from a gym floor. 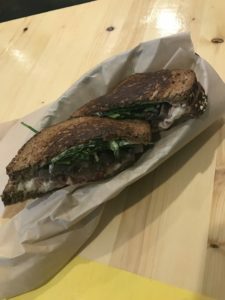 I went up to the counter and asked some questions about what was on the menu, and ended up ordering the “Bella Donna,” a vegetarian sandwich taking its name from portabello mushrooms and thankfully not-deadly nightshade. I paid with CapBucks, which was surprisingly painless, and sat down to wait. Being the only customer at the time, my sandwich was promptly served. On the second occasion, I visited the restaurant with a small group of friends at a much busier time. That time I ordered the “Southern Melt,” one of Newfangled Kitchen’s meatloaf sandwiches, made distinct from its brethren by the addition of some pimento cheese. Once again, the service was fairly prompt, despite there being a few people ahead of my group in line. I have to say that I was impressed with the food on both occasions. Even as a non-vegetarian, the Bella Donna was a treat to eat, although it was a bit sloppy and felt like it was drowning a little bit in the restaurant’s signature “fang sauce,” a smokey, mayonnaise-based condiment. That said, the southern melt was even more to my taste, and was a much cleaner and even more pleasurable dining experience. Both sandwiches were significantly portioned, so much so that I could only eat half of each one and had to take the other to-go. Overall I would have to say I enjoyed my experiences at Newfangled Kitchen. The service was quick, the food was good and well-portioned, the prices were reasonable, and the atmosphere was fun and interesting. While it may not be C’est Si Bon, Newfangled Kitchen is definitely a great addition to dining in Bexley in its own right.